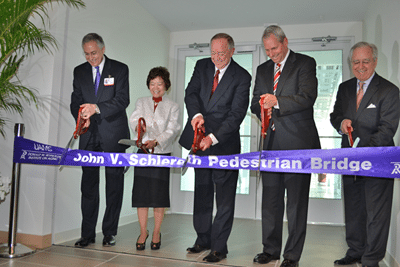 Dan Rahn, Jeanne Wei, John Schlereth, Steven Anderson and John Lessel cut the ribbon for the new pedestrian bridge named in honor of Schlereth and linking the Reynolds Institute on Aging with the Stephens Spine and Neurosciences Institute. LITTLE ROCK – The UAMS Donald W. Reynolds Institute on Aging and the Donald W. Reynolds Foundation today dedicated a new pedestrian bridge at UAMS in honor of John V. Schlereth, of Little Rock, a former Reynolds Foundation trustee and a past chair of the UAMS Foundation Fund Board. In another ceremony that followed, the institute dedicated two outdoor bronze sculptures in honor of their donors, Philip R. Jonsson, a former member of the UAMS Reynolds Institute on Aging Community Advisory Board, and his wife, Diana Yost Jonsson, a current member of the board. UAMS Chancellor Dan Rahn, M.D., welcomed today’s gathering, which included Steven L. Anderson, president of the Reynolds Foundation; and Jeanne Y. Wei, M.D., Ph.D., executive director of the Reynolds Institute on Aging and professor and chair of the Reynolds Department of Geriatrics in the UAMS College of Medicine. The enclosed steel, brick and glass elevated walkway connects the Reynolds Institute on Aging with the Jackson T. Stephens Spine & Neurosciences Institute. Spanning 396 feet, it was made possible by the Reynolds Foundation, which awarded $2.8 million for its construction. The bridge’s funding was part of a $33.4 million Reynolds Foundation gift in 2009 that is also funding a 55,000-square-foot expansion of the UAMS Reynolds Institute on Aging. Rahn noted that Schlereth was serving on both the Reynolds Foundation Board and UAMS Foundation Fund Board in 1997 when the Reynolds Foundation awarded $28.8 million to build the original 101,000-square-foot Reynolds Institute on Aging. At the time it was the largest gift ever made by the foundation. Schlereth, a lifetime member of the UAMS Chancellors Circle, served on the Reynolds Foundation Board from 1994 to 2009 and on the UAMS Foundation Fund Board from 1996-2004, which he chaired for two years. The John V. Schlereth Pedestrian Bridge rises 7 feet from the Institute on Aging to the Spine Institute, with its glass color transitioning to match each building. In addition to its service as a walkway, the bridge also provides a less-expensive, above-ground conduit for UAMS’ chilled water system, which is used to reduce air conditioning costs in campus buildings. The Jonsson Outdoor Bronze Sculptures were unveiled in a ceremony that included Lana Rahn, who chairs the Visual Arts Committee for the Arts of UAMS, and Dan Namingha, the artist who created one of the sculptures. Namingha sculpted Pueblo Eagle Dancer, while the late R.C. Gorman sculpted Seated Woman. Wei spoke on behalf of the Jonssons. Philip Jonsson is the president and chairman of the Board of Signal Media Corp., which owns and operates radio stations in Arkansas and includes Signal Media Publishing. He is an active member of the business and civic communities in Dallas and Little Rock. Diane Jonsson retired from a management career with Saks Fifth Avenue and Neiman Marcus. The sculptures are the first to be displayed outside the Reynolds Institute on Aging building. Lana Rahn, wife of the chancellor, speaking on the significance of art at UAMS, noted that the institute has one of the largest art collections on campus. The Donald W. Reynolds Foundation is a national philanthropic organization founded in 1954 by the late media entrepreneur for whom it is named. Headquartered in Las Vegas, it has committed more than $200 million to improving the lives of elderly people in Arkansas and throughout the United States.